The Gardner-Edgerton offensive line works on staying low and running through the chute every day in practice. The staff, led by first-year head coach Ryan Cornelsen, will sometimes stick bags in front of the players as an obstacle. “You are pretty much almost falling forward into the guy, that’s how low he wants us to be,” senior tight end/defensive end Gage Gulley said. “And getting their shoulder pads into their hips is one of the main things that we shoot for, because when you stand up, you are just giving them your chest to grab and everything. “But when you are lower, they can’t grab or anything, and so you are just getting a push on them,” he added. Gulley, the only Trailblazer who significantly sees time on both sides of the ball, has noticed himself staying consistently lower this year compared to last fall. As well, Gulley has seen improvement in other small, key areas under Cornelsen, along with new strength coach Mark Simoneau and first-year defensive coordinator Chris Walters. These include summer running and conditioning, proper tackling, not panicking when falling behind, lining up correctly for a drill, spotting a lifter in the weight room, stretching correctly and walking outside before games with helmets on. The changes, coupled with a switch from the Eastern Kansas League to the Sunflower League, have yielded a remarkable turnaround. Last season, Gardner-Edgerton went 0-9 and entered this fall on a 10-game losing streak. In 2018, the Trailblazers, even with multiple season-ending injuries and position changes to key players, are 9-0, ranked third in Class 6A and seeded first on the 6A eastern side. Several of their top players were not on the varsity squad in 2017. It marks the first time from 2005 to present that any Kansas team has gone from 0-9 to 9-0 in one season, according to well-known Kansas statistician Tim Hostetter, who runs Prep Power Index. Sunflower League historian Kevin Booker said it’s the first time a Sunflower League school has gone from 0-9 to 9-0 in league annals. The league has been around since the ‘50s and includes 19 schools, 13 currently in the league. “We do all those little things right, eventually you can do the big things right, and that’s what we tell them all the time, we are worried about the process,” Cornelsen said. “We are always about the process. The product will take care of itself if we do all of these little things right. “On the football field, it’s as little as using the correct technique when we tackle, making sure you communicate on the offensive line, not kind of know what to do, but know exactly our checks,” he added. Gardner-Edgerton upset then No. 5-ranked Shawnee Mission East in the season opener, 28-23, and also earned a quality win versus Olathe East, 27-21. The Trailblazers trailed in both games. Each opponent is still alive in the 6A playoffs. This week, Gardner-Edgerton plays host to Shawnee Mission Northwest (5-4) after beating them, 49-27, in the regular season. The Blazers are 2-0 in games decided by seven points or fewer. Last season, they were 0-2 in contests within seven points and 0-5 in games within 15 with former coach Marvin Diener. Diener, one of Kansas’ all-time great coaches, won six state titles at Salina Central and then finished 73-53 at Gardner-Edgerton in 12 years. He retired last November. Since 2009, Cornelsen is 19-8 in one-score contests. Cornelsen, the son of highly acclaimed former Liberal coach Gary Cornelsen, is in his fourth successful head coaching stop. Like his former places, Cornelsen has emphasized a run-heavy offense. Gardner-Edgerton has averaged 383 rushing yards a contest, tops in 11-man football, and has permitted just 78 rushing yards a game. The Blazers have thrown for 48 yards a contest and allowed 142. The offense tallied 15.7 points a game last fall and 39.8 this year. Senior Luke Jennings took over as the main running back after senior Baylor Maxwell, last season’s leading rusher, was lost for the season after Week 2. Jennings has 102 carries for 1,100 yards and 11 scores. Junior quarterback Teven McKelvey split time last season under center. He has 356 passing and 902 rushing yards with 21 scores accounted for. Gardner-Edgerton has also benefited from the switch to the Sunflower League and the conference’s unbalanced schedule. The Trailblazers have avoided two of the top Sunflower League teams in Lawrence Free State (9-0) and Olathe North (7-2). Last year, Gardner-Edgerton played the No. 5 strength of schedule in 6A. This year, the Blazers strength of schedule is No. 30 this year, according to Prep Power Index. Cornelsen has never had a losing record. He has kept the same structure and system throughout the stops. He finished 53-13 at La Crosse and twice achieved four-win one-season improvements in six years. Then, he went to Hays High and led a turnaround from 4-5 to 7-2 in his first fall. In 2011, Cornelsen paced Hays to its first playoff berth since ’95 and went 35-12 at Hays. As well, Cornelsen captured four boys’ track titles and helped build one of the best weight rooms in the western half of Kansas. Then, Cornelsen headed to Hutchinson, posted a three-win improvement in his first year and took the Salthawks to the state title game. He finished 28-15 at Hutchinson and won a track crown in four seasons. Cornelsen, married with three children, called each of the moves “extremely hard,” but liked the Blazers’ setup and facilities. Gardner Edgerton, on the edge of Olathe, is its own school district, which Cornelsen called a “small town feel.” Three junior highs feed into one high school. Gardner-Edgerton announced the hiring of Cornelsen, Simoneau and Walters at the same time in January. Walters also holds the position of assistant head coach. He played a significant role with Cornelsen’s Hays High teams. Walters has coached for 22 years with his last stop as defensive coordinator under Bo Black at Shawnee Mission Northwest. Black took over for Cornelsen at Hays High and coached the Indians for one year before he went to the K.C. area. Walters went through some significant health issues in the last couple of years. He is recovered and has sparked a big defensive turnaround. Gardner-Edgerton has permitted 19.8 points a contest after it allowed 34.4 last year. Gregg Webb has served as an assistant coach/running backs since 2016 and has a similar style to Cornelsen. Webb enjoyed great success with his run-heavy offense at Claflin (nine state title game appearances), Eudora, and in Missouri. Simoneau is one of the most accomplished football athletes in Kansas history. He was a standout at Smith Center, earned All-American at Kansas State and played in the NFL for 10 seasons. Once Simoneau retired, he quickly built a gym business in Kansas City from the ground up. After seven and a half years, Simoneau, married with two elementary-aged daughters, was ready for a change. Two years ago, he assisted at St. Thomas Aquinas. Last fall, he served as an assistant at Blue Valley Southwest. Simoneau had contacts at Gardner-Edgerton, which helped him join the school. In addition to the coaching duties, Simoneau is a strength and conditioning instructor, and Cornelsen is the athletic development teacher. “I get an opportunity to coach them a lot,” Simoneau said. “So in the private sector, you might get an athlete for a month or two, or you might get them for five or six years. Simoneau and Cornelsen did not know each other before arriving at Gardner-Edgerton. The two had multiple phone conversations, met in person and quickly connected. Gulley said Gardner-Edgerton “ran a ton” in the summer, more so than in the past. “Diener was more focused on just getting you bigger, while Mark, he was working on agility, being able to cut and move, and while getting stronger at the same time,” Gulley said. Gardner-Edgerton has often worked with raised ladders, cutting with cones and simply doing down and backs to get in shape. Additionally, the Trailblazers have accomplished multiple drills with just a single line. “We just really focus on movement, and quality of movement,” Simoneau said. During the summer, Gardner-Edgerton often had longer days with 100-yard dashes. The next training session, the Trailblazers ran shorter distances, like 50s. On the third and last training day each week, the Blazers ran staggered distances. Gulley said his conditioning has improved. In the spring, Cornelsen and Simoneau put on a combine for the Gardner-Edgerton players. Early on, they both came to a realization. “We’ve got quite a bit more talent than what we were expecting,” Cornelsen said. Gardner-Edgerton added several pieces from other schools. Darin Robertson, a standout senior linebacker for Class 6A champion Blue Valley North last fall, transferred in. Senior Jacob Hunsperger has 145 carries for 993 yards and 11 scores after wrestling at Aquinas last year. Senior safety Taven Ewbank, a standout safety and wrestler who participated in an elite Marine Corps program last summer, only wrestled in 2017. He played football this fall. Ewbank scored two defensive touchdowns in the first three games but then suffered a season-ending knee injury. Sophomore linebacker Davonte Pritchard has emerged as a standout player with 65 tackles and nine TFLs, both team-bests. Robertson is second with 57 stops. “His motor runs really, really high,” Cornelsen said of Pritchard. Senior Jonah May, last season’s leading tackler, missed three games with a split finger. May had to move to the defensive line, because of the Blazers’ need up front. Senior Peyton Vance, the anchor at nose guard, and May have combined for eight sacks. The offensive line has helped the Trailblazers nearly double their rushing total after 205 yards a game last fall. The line features junior center Shawn Waters. He is 6-foot, 295 pounds. One of those constants is low pad level, honed each day in practice. 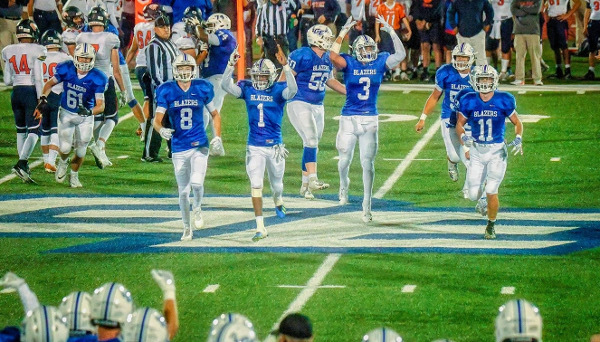 While many 5A/6A schools, especially in the Kansas City area, are known for their passing games, the Blazers have run the ball 437 times, fourth-best in the 11-man ranks.